Adam Braun remembers a night a few years back when he was at a fancy, New York City rooftop soiree having an extended chat with a venture capitalist. About 20 minutes into the conversation, the investor asked Braun about his profession. Braun told him he ran a nonprofit organization. “Immediately, his tone changed. The way that he looked at me changed,” said Braun. The venture capitalist then asked Braun whether the nonprofit “project” was a full-time endeavor, and when Braun responded in the affirmative, the man became aloof and disinterested in further conversation. “I went home and I realized, that was happening a lot in various conversations and rooms that I was in,” says Braun. “I realized the phrase nonprofit does a massive disservice to the broader industry. It’s the only industry that introduces itself with the word non.” Instead, Braun prefers to introduce his organization as for-purpose. Which is not to say that Braun is against the idea of working to make a profit. Quite the contrary; Braun staunchly believes in capitalism and the power of markets. 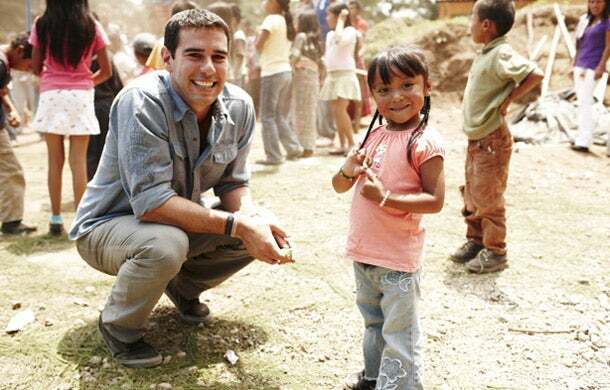 Adam Braun with a student in Guatemala. Braun’s nonprofit has, on many levels, been succeeding not only at the mission-level, but also according to rigorous business standards. Now in its fifth year, Pencils of Promise is turning growth numbers that would please even the most competitive venture capitalist. In 2008, Braun launched Pencils of Promise with $25 and brought in $30,000 worth of donations. In 2009, he brought in $80,000 and in 2010, the organization raised $1 million. In 2011, donations doubled to $2 million, and last year, they topped $5 million. When you are building schools in rural parts of developing countries, that’s enough money to build a lot of schools. A Pencils of Promise classroom costs approximately $10,000 and a school costs $25,000. Since its inception, Pencils of Promise has built more than 150 schools enabling 13,000 children to receive an education. The goal, says Braun, is to build more than 500 schools, train 1,000 teachers and have 10,000 students in the program’s scholarship program. Related: For Social Entrepreneurs, What Comes First: Business or Mission? One way that Pencils of Promise runs like a Fortune 500 company is that its financials are transparent, available for public viewing. You can pull the each year’s financial documents up on the Pencils of Promise website. Those financials show that 85 percent of dollars brought into the organization go directly to programmatic uses, defined as building schools, training teachers and providing students scholarships. Further, 100 percent of the money donated online also goes directly into programmatic functions. Students learning in a school built by Pencils of Promise in Laos. Any administrative expenses that Pencils of Promise has, which Braun prides himself on keeping very slim, come from corporate donations. Individuals making donations often want to be guaranteed that their dollars go directly to helping children. Companies making donations typically have fewer restrictions on where the money can go and how it can be used, says Braun. Also, Pencils of Promise has expertly leveraged business partnerships to help it grow. Braun has worked with a small army of corporate partners, including the likes of Warby Parker, Google, Dolce & Gabbana, Versace, AOL, Vogue, AEG Live, and Birchbox. For businesses that work with Pencils of Promise, the relationship is mutually beneficial. Not only does Pencils of Promise get money and the business gets to write off the donation (Pencils of Promise is a 501(c)(3) organization), but corporate partners also gain a social mission that tends to unite and motivates employees of that corporation. Pencils of Promise started from a drive to help children get access to quality education, no matter where they were born or what socioeconomic status they were born into. When backpacking through India in his early 20s, Braun asked a small boy he encountered who was begging what he would most want in the world. The boy’s response was, “a pencil.” In that moment, the idea for Pencils of Promise was conceived. Braun has no misconceptions that despite his hard-nosed business acumen, Pencils of Promise is a mission-driven organization. But it’s a results-driven, outcome-driven, mission-driven organization. “In order for you to become successful in achieving your mission, the business has to be sound, and the stronger the business is, the more it should complement you achieving your mission and goals,” says Braun. That combination – and Pencil of Promise’s ensuing success -- has made Braun something of a rock star in the entrepreneur and nonprofit space. At the ripe old age of 30, Braun has already been named one of the first 10 World Economic Forum Global Shapers and honored at the United Nations by the Clinton Global Initiative. He has also spoken at the Google Zeitgeist conference and been named to Wired Magazine’s 2012 Smart List of 50 People Changing the World.